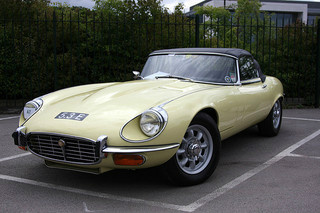 By 1971, the E-Type Jaguar sports car had been around for 10 years, and was beginning to show signs of ageing. Furthermore, there was increased pressure on all car manufacturers to reduce engine emissions. Although such reductions could have been applied to the original 6-cylinder XK engine, the end result would have been much reduced performance. The answer lay in designing a new engine that would satisfy the US emission regulations, and yet still produce the performance the market expected. A V8 was considered but, somehow, it just didn't create the mystique that the E-Type sports car deserved. Yet, the prestigious Ferrari and Lamborghini both sported V12 engines and so, maybe, this was the way to go. In fact, such a unit possessed a number of advantages over the V8, not least was the fact that it ran so much smoother. Furthermore, for a number of years, Jaguar had been developing a V12 engine for their experimental XJ13 race car. This unit was therefore chosen, and further developed into a 5.3 litre, V12 that used a lightweight aluminium block and cylinder head, and would just fit inside the narrow sub-frame of the E-Type. The final design generated efficient combustion, good mid range power, was easier and cheaper to manufacture, and met the anti pollution requirements. It was fitted with electronic ignition, four Stromberg carburettors, and a free flow exhaust system. A badge on the boot identified it as a "V12". The fixed head variant was discontinued, and the remaining convertible and 2+2 fixed head coupe were both fitted with the longer 2+2 wheelbase, unlike the Series 1 and 2, which used the shorter wheelbase. This created a more aggressive image. Power steering and limited slip differential remained standard equipment. However, an anti-roll bar was added, the brakes were improved, and the front suspension geometry was modified for improved ant-dive characteristics. The front sub-frame was strengthened in order to cater for the additional power of the V12, whilst a four outlet exhaust tailpipe added a stylish touch at the rear. Interior improvements included a leather sports steering wheel, new seats, a slightly revised dashboard, and upgraded heating and ventilation. Since both convertible and 2+2 variants were fitted with the longer wheelbase, automatic transmission was available to both, but for the first time on the convertible. The Series 3 offered excellent value for money since it was priced at around half the cost of the competitive Ferrari and Aston Martin models. 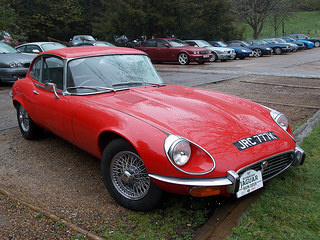 However, some E-Type aficionados pointed out that the Series 3 was a gentleman's sports car, and was a far cry from the original down-to-earth style of the Series 1 and 2 Jaguar cars. Furthermore, some critics said that the new V12 engine deserved a completely redesigned car rather than remarketing the updated original model. By now, it was obvious that the days of the Series 3 Jaguar sports car were numbered. In fact, as it turned out, the 2+2 coupe was discontinued at the end of 1973, with the convertible following it in February 1975. 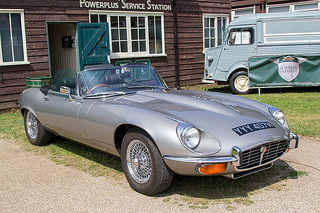 The last 50 convertibles built were painted black, and each received a brass plaque on the dashboard, signed by the founder of Jaguar, Sir William Lyons, to signify these were the last E-Types built. Interestingly, these last units turned out to be difficult to sell which, sadly, reflected the market's indifference at that time. As a mark of respect for the legendary E-Type Jaguar sports car, the last unit built was kept as a showpiece by the company. 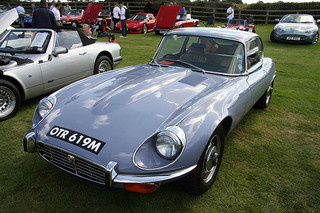 Following fourteen years of production, over 72,000 E-Types were produced, with over 80% being exported. In terms of total units produced, 15,287 Series 3 E-Types were built, consisting of: 7,990 convertibles, and 7,297 2+2 fixed head coupes. In fact, only 2,116 right hand drive versions of the Series 3 convertible were produced. 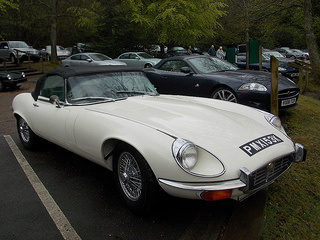 In terms of sales of these Jaguar cars, since the convertible was the more popular, then an example in good condition could command between $60,000 and $80,000, whilst one in showroom condition could reach as much as $150,000. 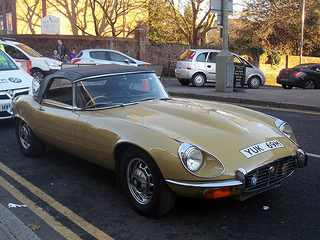 Of all Jaguar cars, this must surely rate as the most beautiful. 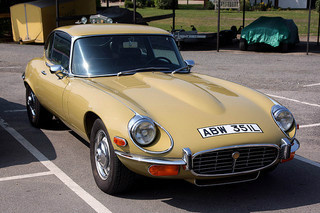 A 1971-74 Jaguar E-Type Series 3 high mileage example would fetch around £48,000/$77,000, whilst a superb example would command in the region of £125,000/$200,000.